The study, based upon 2007-2008 methane emissions, concluded that fossil fuel extraction and refining, plus cattle farming were the major under-reported contributors. 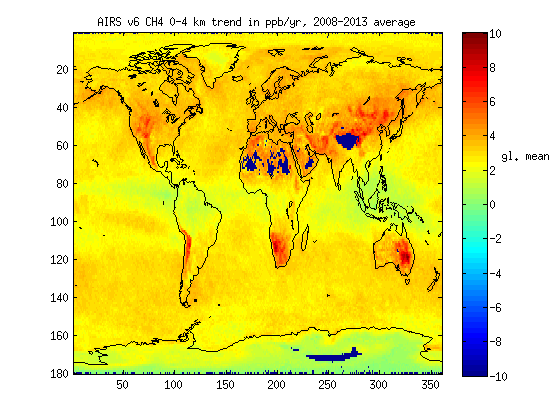 It estimated that 50-70% more CH4 entered the atmosphere annually than being presumed by the US EPA. The greatest divergence in the reported vs new estimate was in the South Central United States - Texas, Oklahoma, and Kansas. As the study is based on CH4 emissions readings from 2007-2008, these revised figures do not reflect the impact that the fracking boom may have also had on methane emissions. 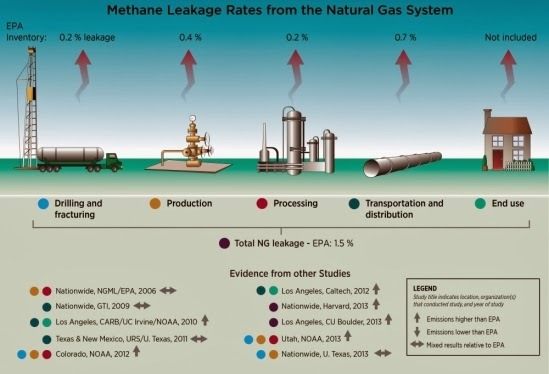 This week another paper, which reviewed 200 papers on US methane totals and sources of release, substantiated these conclusions, that the EPA estimates of annual methane release were approximately 50% too low. Much of this higher estimate is attributed to the US natural gas boom, with most problems concentrated at a few emission points. This last comment leads to an example of what space-based CH4 monitoring can tell us about US emissions trends. 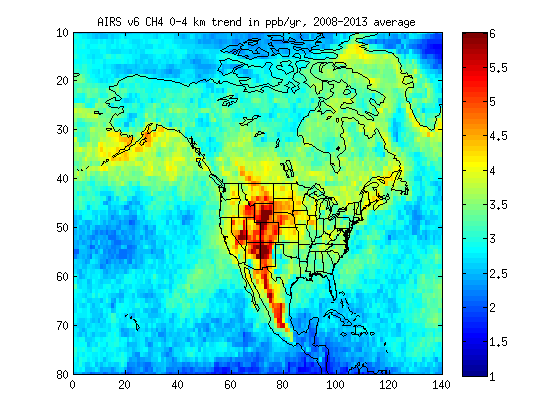 What is revealed are the major annual increases in CH4 ppb releases in the Southwest and Central US during 2008-2013.The AIRSv6 0-4 km CH4 annual increases correlate with areas substantially associated with the natural gas and oil or cattle production discussed in the articles. Another source for the annual ppb increases may be forest fires in the US West, and tree kills due too pine beetle infestation. The 2012 drought may have also had an impact. However when the US ppb/yr increases are compared to global annual CH4 ppb trends, it reveals that Australia, South Africa and Asia/China had higher rates of increase, perhaps due to a mix of drought, flooding and increasing pollution rates in China. I'll post more on space-based methane monitoring in following posts.